Do you have an old, dying tree that is just ugly, or do you have a tree that is problematic for any reason? 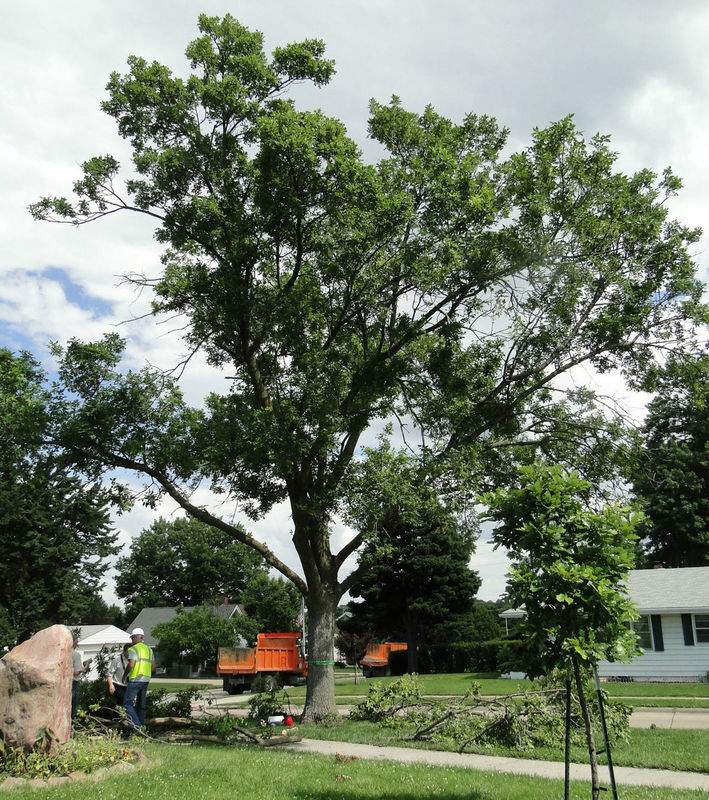 Call Cedar Rapids Tree Service for a fast, free estimate to remove it. We know removing a tree that is problematic, but otherwise completely healthy, is a difficult decision. However, there are very valid reasons to remove trees that are causing problems, such as a danger to life and property, creating landscape issues, etc. Or, perhaps the tree is starting to die and dead branches are falling creating a hazardous or otherwise ugly situation. No matter the reason, we can provide you with an affordable option to remove the tree in an effective and completely safe manner. Removing a tree, while not a complication, does require expertise and equipment. Even if we climb the tree to remove it, skill, experience, and quality equipment are necessary for a safe and efficient job. To safely remove a tree, we can use a bucket truck, if it can easily access the tree, or we have crew members that are experts at climbing. Regardless we will start the removal process from the top down - we never fall a tree. Instead, we dismember it from the crown down the main trunk, always lowing heavy limbs with hoists so they can then safely and efficiently be cut up into smaller segments. The small limbs will be disposed of via our wood chipper positioned at the curb nearest the tree. We have a ground crew of 2-4 team members that perform all the removal work and keep your property clean during the entire process. Our tree removals always begin with a free, on-site estimate process. When you call us, we can usually get out to your property for the estimate the same day. During the estimate, we will detail how we can best remove the tree (climbing or bucket truck) and go over other specifics, such as would you like the wood removed or stacked somewhere on your property for future wood burning. We will provide a verbal estimate at this time and follow that up with a written one submitted to you via email. This written estimate will also include our licensing and insurance information, provided directly by our insurance carrier. If select us for the job, we can usually get the work scheduled for completion within 2-5 business days. We have multiple teams, so we can be very responsive with short turnarounds from estimate to work completion. Call the tree service Cedar Rapids has trusted for almost two decades now to safely, efficiently, and affordably remove your trees. We offer discounts on multiple tree services, such as tree trimming and removal. Tree Size - larger trees cost more to remove than smaller trees because it takes more time and labor to remove large trees, plus sometimes specialized equipment is required. Tree Location - a tree in the wide open, away from all structures is more straightforward to remove as not special precautions needs to be taken to protect power lines or homes. Tree Species - some trees are a bit more challenging to remove due to their growth nature. For example, Locust trees have multiple trunks that often lean requiring little extra labor to remove safely. Generally, tree removal prices will range from $400 to over $2,000 depending on the factors above. Tree removal Cedar Rapids trusts is what we do. Call for a free estimate or complete our contact form.